MORE STATE UPDATES: Texas issued their first grant RFP for K-12 textbooks, as established under SB 1784. The new education appropriations bill HF 4328 in Minnesota would require Boards of Trustees at state schools to develop plans to increase affordable textbook options on campus and set goals for how widely they’re used. Virginia has started implementing HB 454, which requires that institutions develop guidelines for OER. NEW PUBLISHING TOOL: Rebus Community unveiled their new “Rebus Projects” this week – a platform that facilitates OER publishing. The platform is a space to manage different open textbook projects, coordinate contributors, and work through editing and collaborations. Head here to try out the Beta. STATE OF THE COMMONS: Creative Commons published their annual “State of the Commons” report this month. The report profiles a variety of aspects in the field of open, but the biggest highlight is that there are now at least 1.4 billion CC-licensed works available worldwide. LAST CALL: Northeast OER Summit is a multi-state collaborative event for new and experienced OER advocates to share effective practices on May 31 – June 1. Register by May 24 here. LAST CALL: The BCcampus Festival of Learning is coming up on May 28-30. Registration is still open here. REGISTER: Iowa and Nebraska are co-hosting a multi-site #GoOpen Summit on June 11. Find more information and registration here. REGISTER: Saylor Academy is hosting a Summit on the Credentialing Economy in Washington, DC, on June 7-8. Register here. JOB: SPARC is hiring an Assistant Director of Open Education. The job posting seeks a recent graduate or early career professional who is passionate about Open to be based in Washington, DC or remotely. Details here. Check out the Texas Toolkit for OER Course Markings, a guide developed by UT Arlington librarian Michelle Reed to support implementation of marking OER in course catalogs, which became a statewide requirement in Texas last year through SB 810. The toolkit was originally Michelle’s capstone project in the SPARC Open Education Leadership Program, and is now being expanded to include case studies. NEW CO-AUTHOR: Hi! This is Camille Thomas. I am very excited to be SPARC’s first Open Education Fellow! I am the Scholarly Publishing Librarian at Texas Tech University in Lubbock, Texas. For the next few months, my work will include working on the digest, LibOER calls, etc. as well as building relationships with new community partners to grow awareness and support for Open Educational Resources. You can contact me at camille@sparcopen.org. $1 TRILLION AND COUNTING: Student debt in the United States has been a $1 trillion problem for at least six years. Currently, the total debt is $1.5 trillion and financial aid expenditures for textbooks is $3 billion per year. Several articles and opinion pieces have surfaced covering the need for affordable education and how growing costs affect life after higher education. These pieces provide important context for OER advocates working in higher education. ETEXTBOOK PRICE DROP? Inside Higher Ed reports that while new print textbooks are still costly, the price of etextbooks is falling, according to data from etextbook distribution platforms which work with major publishers. Since 2016, the average price of etextbooks on VitalSource has fallen by 31 percent, from $56.36 in 2016 to $38.65 in 2018. OER advocates questioned the significance of these numbers, noting that it reflects a shift to renting versus buying access to content, and that discounts are likely temporary. IN THE STATES: Governor Hickenlooper of Colorado signed into law HB18-1331, creating an OER council and appropriating $660K for OER grants and other activities. Edison State Community College is teaming up with the Ohio Association of Community Colleges (OACC) as well as universities from around Ohio to reduce the cost of student textbooks. The initiative, named Open Educational Resources (OER), is supported by a $1.3 million Innovation Grant from the Ohio Department of Higher Education. SAVINGS AND MORE: New York Gov. Andrew Cuomo announced an $8 million investment in open educational resources in 2017. Ann Fiddler, Open Education Librarian at the City University of New York, wrote an op-ed about bringing OER to scale for CUNY’s 500,000 students over the past year and how open education means so much more than financial savings. REGISTER: The Open Education Southern Symposium is being hosted by the University of Arkansas in Fayetteville on October 1st-2nd. Register here. Proposals are still being accepted until May 31st. CALL FOR PROPOSALS: Proposals to host the 2019 Open Education Global Conference is re-opened. Traditionally, the Conference is held in the spring but starting in 2019, the conference is moving to the Fall with preference for the month of November. More information here. WRAP UPS: In case you missed any of these great conferences, report-backs are available from the San Diego GoOpen Summit and the Creative Commons Summit. Also, check out the blog post roundup for OER18, which includes multimedia and Twitter coverage of the event. The archive of livestreamed sessions at OE Global is available here. LAST CALL: May 11th is the priority application deadline for SPARC’s Open Educational Leadership Program for library professionals. Apply here. The University of Michigan has published a new High Performance Computing open textbook, updating an out of print text to have more practical information for scientists who need to write and run their programs as part of their research. The textbook can be found in MERLOT and is available for print-on-demand. HAPPY #OEWEEK: from the OER Digest team! It’s been great to see the many events happening across the globe to promote open education — from student tables to faculty workshops to regional events. Check out the list of events around the world at the official Open Education Week website, or keep up with the latest coverage under the many permutations of #OEWeek on Twitter. CALL CONGRESS TODAY: to ask that an open textbooks grant be included in the federal budget for the current fiscal year, due to be finalized in the next few days. The budget deal reached last month sets aside $2 billion this year for “college affordability and completion” initiatives, and we’d like to see $10 million go to support OER adoption and creation via a short term federal grant program. Thanks to the OER community’s support, SPARC and U.S. PIRG delivered letters from libraries and student governments calling on Congress to fund open textbook grants, and have generated hundreds of calls to key House and Senate lawmakers. Check out the twitterstream at #opentextbooksFY18 or contact katie@sparcopen.org or kvitez@pirg.org for more information on how to get involved. CHART-TOPPING CURRICULUM: The second openly-licensed curriculum from Open Up Resources, EL Education K–5 Language Arts, has just become the top-rated K-5 ELA curriculum on EdReports, the Consumer Reports of K–12 materials. It’s now the highest-rated elementary curriculum that they’ve ever reviewed. IN THE STATES: Legislation in Iowa would require institutions to mark OER in course catalogs. The bill was recommended favorably by Senate subcommittee, and if passed would make Iowa the first state in the Midwest to enact this kind of law. A bill in Washington creating a pilot grant program for four-year institutions now heads to the governor’s desk. DEFINING OPEN: In light of the recent introduction of new OER-based products by Cengage, Macmillan, and other publishers, there has been a flurry of blogs on what materials or characteristics can be considered open. Paul Stacey reflects on framing good citizenship in the commons, and ISKME, Ed Tech Strategies, and AAC&U released their “CARE” framework for evaluating OER-based courseware as the movement grows: contribute, attribute, release, and empower. Have your own thoughts on the topic that you’d like to share? 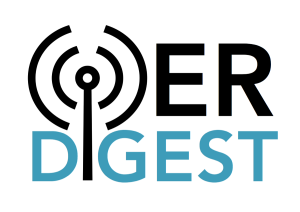 Send them to the OER Digest to be featured in the next edition! CH-CH-CH-CHANGES: Some major news broke in the traditional publishing market that OER advocates should know about: Pearson announced that it is selling its K-12 division despite a rise in profits in the past fiscal year as it pushes out more digital content. Their K-12 offerings, mostly traditional textbooks, are out of sync with the publisher’s “digital transformation strategy” rebrand as a courseware developer. This is part of a larger trend of publishers moving away from print towards what Pearson’s CEO calls the “Spotify” model – streaming digital access without ownership. GROWING #GOOPEN: The U.S. Department of Education announced a new partnership with the Institute for the Study and of Knowledge and Management in Education (ISKME) to expand and enhance the #GoOpen network. The partnership will facilitate the sharing of OER and implementation strategies and integrate evidence of the efficacy of OER into the broader education policy dialogue. From Rebecca Morales and Alesha Baker comes an article in the Journal of Interactive Media in Education titled “Secondary Students’ Perceptions of Open Science Textbooks.” The article, which explores the perceptions of 6th-8th graders in a suburban public school, includes findings that students’ perceptions of an open textbook in place of a standard textbook are improving students’ attitudes and behaviors toward learning.